Your ultralight shelter is only as good as its seams. 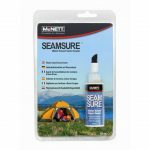 SilNet™ is specially formulated for sealing seams on tents and other outdoor products constructed or coated with silicone, such as silicone treated nylon. SilNet may also be used as an infield repair material for moderate rips, tears and areas of abrasion. If you own a silnylon tent, SilNet is a must-have (unless you like sleeping in puddles). That’s because sil-nylon tents typically aren’t sealed at the factory. Stay dry! Use SilNet to seal the seams on your silicone-treated tent, tarp, backpack and rainwear. Use it to repair pinhole leaks, too. SilNet is part of a comprehensive line of Care and Repair products from McNett®. With McNett®, anyone can be a master of equipment repair. SilNet™ is part of the McNett GEAR AID™ product range. Apply from tube or with brush. 1) CLEAN surfaces with isopropyl alcohol. 2) APPLY SilNet to inside of seam: apply thin film across taut threads and under folds. 3) LET DRY 3-6 hours. Test before use or folding. Adhesive Applications: Roughen and clean surfaces. Apply SilNet to both surfaces. Allow to dry 15 minutes, then join (clamp or tape) surfaces together overnight. NOTE: Fully cured SilNet may cling to itself when folded. After first application, lightly dust fully cured areas with ProTalc™ High Performance Dry Lubricant and Protectant or talcum powder. CLEAN UP AND STORAGE: Wipe tube threads. Advance contents to tube neck and replace original cap securely. Store in cool, dry place. Clean hands with soap and water. When do I use a silicone adhesive or seam sealer? To give some background. Typically, a tent fly is made of nylon. Nylon is not waterproof, so typically manufacturers will apply a PU (polyurethane) coating to the underside of the nylon fabric to make it waterproof. They may also add a water repellent (DWR) to the outside of the tent fly to help water bead up and roll off. This is the most typical rain fly treatment. It is also common to apply a polyurethane (PU) coating to the underside of the nylon fly and a silicone treatment to the outside of the rain fly to help water bead up and roll of. This is a „silicone-treated“ fabric. They have coated the underside with a polyurethane coating and have applied a silicone treatment to the outside of the rain fly to help with water repellency. The last common type of tent fly treatment is silnylon. A silnylon tent fly has a silicone treatment applied to the underside of the fabric and a silicone treatment applied to the top side of the fabric. The silicone is then infused from both sides into the fabric. Silnylon fabrics tend to be ultralight and expensive. The downside to silicone and silnylon is that most adhesives and repair patches will not bind to silicone. That is why we have Sil Fix (not available in Europe yet http://www.mcnett.com/gearaid/sil-fix#10465) for making repairs and SilNet (http://www.mcnett.com/gearaid/silnet#10440) for seam sealing silnylon or silicone treated fabrics. So which glue is best for your specific application? 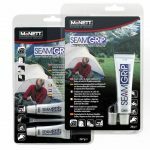 For standard tents (DWR treatment on outside, PU coating on underside) we recommend Seam Grip (https://outdoor.mcnett.eu/?page_id=226) for smaller backpacking tents and Seam Sure (https://outdoor.mcnett.eu/?page_id=719) for larger family sized tents, which tend to see less field use. For more information on seam sealing standard tents, click here: https://mcnett.zendesk.com/entries/21026286-How-to-Seam-Seal-A-Tent. For Silicone-Treated tents: if you are making a repair to the silicone treated side (top side of the rain fly) we recommend Sil-Fix (not available in Europe yet). If you are making a repair to the PU-coated side of the tent fly (underside), we recommend Seam Grip. You can make repairs to either side of the tent fly, just make sure you are using the appropriate adhesive. If you are not sure if your tent is silicone treated, I would recommend making repairs to the underside of the tent with Seam Grip. 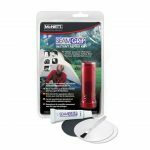 If you are seam sealing a silicone-treated tent, we always recommend seam sealing from the underside of the tent fly (to prevent yellowing from UV rays), so Seam Grip is ideal. If you have to seam seal the outside of the of a silicone-treated tent, you will use Sil Net. For silnylon tents and fabrics, you will use Sil-Fix (not available in Europe yet) for making repairs and Sil Net for seam sealing. FAQ: What’s the difference between SilNet, Seam Grip and Sil-Fix? SilNet™ is our silicone-based seam sealer for all silicone treated fabrics. When applied to seams it will ‘self-level’ creating a smooth sealed seam. SilNet is the best product to use to create good looking sealed seams on silnylon tents, tarps and other items. SilNet has only modest repair adhesive qualities (OK for pinholes). SilNet won’t bond properly to non-siliconized fabrics. Seam Grip® is a urethane-based seam sealer and repair adhesive. Seam Grip is the best product to seal and repair all types of fabrics except those treated with silicone. Seam Grip self levels to create a good looking sealed seam. It is also an extremely strong repair adhesive. Seam Grip permanently seals and repairs tent, backpack, outerwear and footwear fabrics including PU coated fabrics, Gore-Tex® fabric and more. Seam Grip won’t bond properly to silnylon or other silicone treated fabrics. Re-coat worn areas on your tent floor with Tent Sure™ Tent Floor Sealant. Apply to the coated side of the fabric (the inside) using a large foam paintbrush. For best results apply Tent Sure in a thin film, using even, sweeping motions to avoid puddles. A single thin coat works best. When it’s windy, mosquitoes will congregate on the lee side of objects to avoid being blown away. So pitch your tent door into the wind. You’ll be able to enter without bringing the swarm in with you.